Liang, X., Sun, B., Liu, Y., Zhang, B., Shan, Y., Song, X., and Nie, S. (2019). "Regulation of superoxide anion radicals in bagasse alkali-oxygen pulping to enhance delignification selectively," BioRes. 14(1), 638-649. Alkali-oxygen pulping has received increasing attention as an environmentally compatible pulping process; however, the resulting pulp has low yield and properties due to carbohydrate degradation. In this work, the effect of regulating superoxide anion radicals (O2-•) on delignification selectivity in alkali-oxygen pulping was investigated. The pulp was characterized by Brunauer-Emmett-Teller (BET) analysis, scanning electron microscope (SEM), and X-ray diffraction (XRD). Lignin removal was improved by the regulation of O2-• in the 1,2,3-trihydroxybenzene auto-oxidation system with addition of sodium 2-anthraquinonesulfonate, especially for the pulp from cooking time 120 min. The degree and selectivity of delignification were improved with alkali-oxygen pulping when sodium 2-anthraquinonesulfonate was added to facilitate the generation of superoxide anion radicals. The results showed that the increased fiber liberation was beneficial for the accessibility of O2-• to lignin, which would improve the removal of lignin with negligible damage on cellulose, especially with regards to crystal area. Alkali-oxygen pulping is widely used to pulp non-wood. This method has low chemical costs and can be environmentally friendly (Chen and Hayashi 1997, 1999). Its other advantages include low alkali charge and low cooking temperature compared with conventional alkali pulping (Chen and Hayashi 1997; Hata et al. 2008; Zhang et al. 2008; Chen 2009). Sugarcane bagasse is an important agro-based lignocellulose that is renewable; it has loose fiber structure (Zhao et al. 2010; Kapoor et al. 2017) and has a high cellulose content of 40% (Saha 2003; Dinesh et al. 2006). These characteristics make bagasse suitable for alkali-oxygen pulping. Li et al. (2012) and Hata et al. (2008) have reported the use of NaOH and oxygen pulping of non-wood plant materials. Bagasse alkali-oxygen pulping involves two distinct delignification phases: the bulk phase and the residual phase (Fernandez et al. 1985; Sabatier et al. 1993). The ratio of p-hydroxyphenyl-to-guaiacyl-to-syringyl (H:G:S) units of bagasse lignin is 2:38:60 (Río et al. 2015); the high content of syringyl units is beneficial for improving the delignification rate (Yang 2010). In the bulk phase of alkali-oxygen pulping, primarily -O-4, -5 and other condensed substructures (Río et al. 2015) could be removed as much as possible due to lower oxygen delignification resistance (Agarwal et al. 1999; Poukka et al. 1999). In addition, the delignification selectivity is remarkable because the reactive activity of cellulose mainly affected by the accessibility of fiber (Lin et al. 2018) and less fiber was exposed during the initial cooking. However, the delignification selectivity decreased after the end of the bulk phase, leading to an increase in carbohydrate degradation and a decrease in lignin depolymerization and removal. Carbohydrate degradation is mainly caused by HO• (Ek et al. 1989; Gratzl 1992; Guay et al. 2000; Reitberger et al. 2001). O2•- has a low oxidation potential of 0.41V, (Gierer 1997; Ragauskas et al 2005). However, it also could degrade aromatic rings and conjugate a double bond, especially under the synergy with HO•, and it has little effect on carbohydrate. Hence, it is important to regulate the reactions of O2-• and HO• with lignin in order to improve alkali-oxygen pulping selectivity. Several researchers have suggested that sodium 2-anthraquinonesulfonate can facilitate O2-• generation and can improve delignification selectivity during oxygen delignification of bamboo kraft pulp (Cao et al. 2006; Cao et al. 2007; Gümüşkaya et al. 2011). However, the scientific literature does not report on the control of O2-• during the alkali-oxygen pulping of bagasse in order to improve delignification selectivity. In this study, the bagasse pulp was treated by 1,2,3-trihydroxybenzene auto-oxidation system, which could generate O2-•, to reveal the effect of O2-• on delignification of alkali-oxygen pulp. Afterwards, the characteristics of the resulting bagasse pulp were investigated to measure differences in delignification selectivity during the pulping process. Finally, the sodium 2-anthraquinonesulfonate was added as O2-• promoter to improve the pulping properties, and the resulting pulp was characterized by BET, SEM and XRD to determine the mechanism of improved delignification selectivity. Air-dried and de-pithed sugarcane bagasse was provided by the Yunnan Xinping Nan’en Sugar and Paper Co., Ltd. (Yunnan Province, China). Sodium 2-anthraquinonesulfonate was purchased from the Shanghai Aladdin Reagent Co., Ltd. (Shanghai, China). Other chemical reagents used were of analytical grade and were made in China. Alkali-oxygen pulping of bagasse was performed in a 15 L rotating autoclave reactors heated by heating mantles with temperature controllers. The cooking conditions were: NaOH charge 23% (on o.d. biomass); MgSO4 charge 0.5% (on o.d. biomass); 7.33:1 liquor-to-bagasse ratio; initial oxygen pressure 0.6 MPa; and maximum temperature 100 °C for a given reaction time. O2-• was produced by the auto-oxidation of 1,2,3-trihydroxybenzene. The bagasse alkali-oxygen pulp, 1,2,3-trihydroxybenzene solution, and 100 mmol/L tris(hydroxyl-methyl)aminomethane hydrochloride (Tris-HCl) buffer solution (pH = 8.2) were mixed in a plastic bag, the pulp consistency was adjusted to 12% by distilled water, and the reaction was performed at 60 °C for 60 min in water bath. Various charges of sodium 2-anthraquinonesulfonate was added to the plastic bag for the reactions of O2-• with bagasse pulp as the radical promoter. The sodium 2-anthraquinonesulfonate was used as the O2-• promoter. The conditions of alkali-oxygen pulping with the O2-• promoter were the same as for the above-described alkali-oxygen pulping except that the promoter was added at 120 min of the total 240 min of pulping time. where S is delignification selectivity, L is the amount of delignification (%), K0 and K1 are kappa numbers of the pulp before and after treatment, V is the amount of intrinsic viscosity reduction (%), and V0 and V1 are intrinsic viscosities of the pulps before and after treatment. where A(cryst) is the cellulose crystallinity of bagasse pulp (%), and A(amorph) is the amorphous cellulose content of bagasse pulp (%) (Focher et al. 2001). The average pore diameters and the pore size distributions of the pulps were measured by using a BJH surface area and pore size analyzer (NOVA2000e, Quantachrome Instruments, Boynton Beach, FL, USA), which is based on the Brunauer-Emmett-Teller (BET) nitrogen adsorption isotherm principle. The air-dried pulps were milled and screened with 40/60 mesh screens; the screened material was oven-dried at 105 °C for 4 h.
The morphologies of the pulps were observed by using a tungsten filament scanning electron microscope (SEM) (VEGA-3SBH, Tescan Corporation, Czech Republic). Figure 1 presents a hypothetical mechanism for improving alkali-oxygen delignification selectivity. The proposed mechanism is based on the following premises. (1)	O2-• can react with alkali-oxygen pulp with minimum carbohydrate degradation. The regulation of radicals during alkali-oxygen pulping would improve delignification selectivity. (2)	Sodium 2-anthraquinonesulfonate can facilitate the generation of O2-• during alkali-oxygen pulping. (3)	Delignification selectivity is higher in the initial phase of alkali-oxygen pulping, whereas delignification selectivity is lower in the later phase. Addition of sodium 2-anthraquinonesulfonate improves alkali-oxygen delignification selectivity, which results in higher pulp yield with less fiber damage. The differences in delignification selectivity of alkaline pulping versus oxygen delignification process have been reported in the literature. Barroca et al. (2001) noted that delignification selectivity was higher in the initial phase and lower in the later phase with the oxygen delignification of eucalypt kraft pulps. Samuelson and Abrahamsson (1978) reported that carbohydrate degradation is appreciable at the end of oxygen delignification of alkaline pulps, which negatively effects paper properties. Sjöblom (1996) disclosed that the selectivity of kraft pulping decreased as lignin removal increased, while the increased removal of lignin in the bulk delignification phase would result in higher intrinsic viscosity of pulp for a given kappa number. 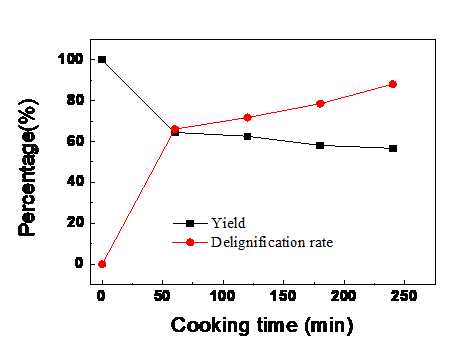 This means that the delignification rate was higher in initial cooking, which is a benefit for increasing the quality of pulps as the resulting pulps with the similar kappa number. Therefore, it is important to increase delignification selectivity by the regulation of O2-• during the alkali-oxygen pulping process. Several researchers have reported that O2-• is generated by the 1,2,3-trihydroxybenzene auto-oxidation reaction (Marklund and Marklund 1974; Gao et al. 1997; Alanko et al. 1999). Gierer et al. (1994) and Reitberger et al. (2001) indicated that O2-• has the ability to react with phenolic and carbon-centered radicals, which results in aromatic ring opening or cleavage of a carbon-carbon bond in the aliphatic side chain. Cao et al. (2006) proposed that addition of sodium 2-anthraquinonesulfonate during oxygen delignification of bamboo pulps could effectively improve the delignification degree and selectivity. Hence, this paper will present enhanced delignification selectivity by the addition of sodium 2-anthraquinonesulfonate during the alkali-oxygen pulping of bagasse, which results in good quality pulp. Gao et al. (1997) reported that 1,2,3-trihydroxybenzene auto-oxidation could produce O2-•. 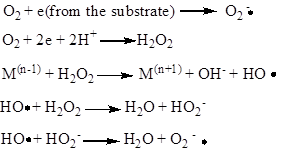 The pulps in this study, which were produced by alkali-oxygen pulping, were treated with 2% to 6% of 1,2,3-trihydroxybenzene to generate O2-•; the results are shown in Table 1. Delignification selectivity was not calculated for 60 min pulp since the pulp was not sufficiently cooked to the fiber liberation point, which would allow for the determination of kappa number and intrinsic pulp viscosity. Zhan et al. (2011) reported that fibers can be separated only when the lignin concentration of the middle lamella (ML) layer has been sufficiently reduced. As the charge of 1,2,3-trihydroxybenzene increased, the kappa number of the pulp decreased with very little effect on the pulp intrinsic viscosity. For example, as for alkali-oxygen pulps (the kappa number of 25.0) from cooking time 120 min, when 1,2,3-trihydroxybenzene charge was 6%, the kappa number decreased to 20.4 and there was little change in the intrinsic viscosity; these results indicated O2-• had good ability and selectivity of delignification. Regarding the pulp from cooking time 60 min and 180 min, the kappa number did not decline when the 1,2,3-trihydroxybenzene charge increased from 4% to 6%. This is because O2-• has low oxidation properties of 0.41V, limiting the delignification ability (Gierer 1997; Ragauskas et al. 2005). In addition, the lignin concentration was high at the cooking time of 60 min and O2-• had a short lifetime, which limited the reaction between O2-• and inner lignin. The delignification resistance of residual non-phenolic lignin was high at the cooking time of 180 min. Therefore, the delignification ability and selectivity of O2-• on pulp at the cooking time of 120 min were optimal in this study. In summary, examination of the results on O2-• to delignify at various pulping times suggested that the optimum delignification efficiency occurred at 120 min. To further improve the delignification selectivity, the O2-• promoter should be added at alkali-oxygen pulping time of 120 min. Sodium 2-anthraquinonesulfonate was used as O2-• promoter in this study. The delignification results with the 1,2,3-trihydroxybenzene system with the O2-• promoter are presented in Table 2. The kappa number decreased from 23.3 to 22.6 when the promoter charge increased from 0% to 0.5%. The removal rate increased from 2.92% to 5.83% with only a loss of 23 to 30 mL/g of intrinsic viscosity. Delignification was enhanced with little effect on intrinsic viscosity, which suggested that O2-• was generated by the addition of sodium 2-anthraquinonesulfonate. Although the mechanism of generating O2-• is unknown, Cao et al. (2007) showed that sodium 2-anthraquinonesulfonate could facilitate O2-• generation and improve the delignification selectivity of oxygen delignification of bamboo kraft pulps. Thus, it is feasible that sodium 2-anthraquinonesulfonate can be used as an O2-• promoter during alkali-oxygen pulping to regulate O2-• in order to improve delignification selectivity. The pulping results from alkali-oxygen cooking are shown in Figs. 2 and 3. Pulp yields obviously decreased. The delignification rate was high, which was 66.0% after the first 60 min; afterwards, the rate decreased. The average fiber pore size reached its maximum value and the cellulose crystallinity index increased within the first 60 min. This was attributed to the dissolution of lignin and hemicelluloses. While after 60 min, the delignification rate increased slowly with prolonged cooking time due to the decrease in alkali content and increase in activation energy (Chang et al. 1973; Nada et al. 1998). The decreased delignification selectivity resulted from the condensed phenolic units in residual lignin, LCC structure (Li 1999; Torbjörn et al. 2001), and the exposure of carbohydrate (Heiningen and Ji 2012). Especially after cooking for 180 min, the degradation of carbohydrate increased. The lignin was removed with high efficiency within the first 60 min of alkali-oxygen pulping, and the fibers were separated. The average pore size of the fibers increased from 7.19 nm to 12.74 nm within the first 60 min (Table 3). The removal of lignin and hemicelluloses from the cell wall opened the fiber structures and formed more voids among fibrils (i.e., new pores with size less than 10 nm), which resulted in a decrease of average pore size after 60 min of pulping time (Jiang et al. 2016; Huang et al. 2017). The average pore size of the fibers increased and more voids among fibrils formed, which caused the fiber cell wall to become loose and expose lignin to chemical liquor and active oxygen, which would improve the accessibility of the pulp. The crystallinity index increased at first, which can be ascribed to many uncondensed phenolic units and olefinic structures, such as stilbenes and enol ethers becoming degraded and dissolved out (Ljunggren 1990; Zhen et al. 2018; Zhang et al. 2018). 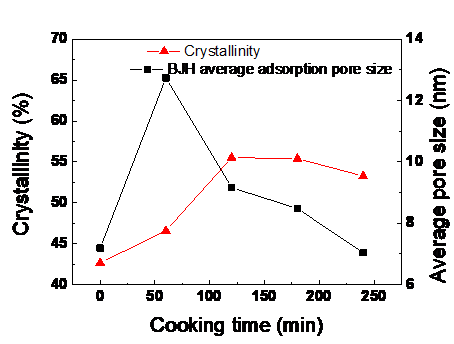 The crystallinity index declined after cooking for 120 min, which means that the fibers crystalline areas were damaged as a consequence of the increased of swelling degree and the number of voids. These changes would improve the accessibility of alkali to fiber. These results are in agreement with an earlier study (Ma 2014). In summary, the delignification selectivity performed remarkably in the initial 120 min of alkali-oxygen pulping. After that, it is essential to regulate the proportion of O2-• for improving the delignification selectivity. Thus the O2-• promoter was added in alkali-oxygen pulping system at a cooking time of 120 min. Fig. 4. SEM 5.0 kx of bagasse pulp: (a) without sodium 2-anthraquinonesulfonate; (b) with 0.1% sodium 2-anthraquinonesulfonate; (c) with 0.2% sodium 2-anthraquinonesulfonate. Figure 4 shows the effect of O2-• promoter on fiber morphology of the resulting alkali-oxygen pulp. The results are similar to the morphology of alkali-oxygen pulp; the amount of small pores on the fibers decreased as the charge of O2-• promoter increased. The results are agreement with that of pore diameter distribution. The above observations indicated that carbohydrate degradation decreased and delignification selectivity increased with the addition of O2-• promoter in the alkali-oxygen pulping process. Superoxide anion radicals (O2-•) can selectively delignify bagasse at an alkali-oxygen pulping time of 120 min. Sodium 2-anthraquinonesulfonate, an O2-• radical promoter, was added at an alkali-oxygen pulping time of 120 min; delignification was improved and carbohydrate degradation was inhibited. Compared with control sample, when 0.2% sodium 2-anthraquinonesulfonate was added, the yield of alkali-oxygen pulping was increased by 1.97 percent from 57.4% to 59.4%, and the kappa number of pulp was decreased with slightly increased intrinsic viscosity. Delignification selectivity was enhanced due to the regulation of O2-• in the alkali-oxygen pulping process. In addition, facilitated generation of O2-• was beneficial for increasing the delignification with negligible damage on fiber, and the crystallinity index of resulting pulps was increased. The authors gratefully acknowledge the financial support from the National Natural Science Foundation of China (Grant No. 21466017 and 31460176) as well as the Opening Project of Guangxi Key Laboratory of Clean Pulp and Papermaking and Pollution Control (Grant No. KF201718 and KF201602). Agarwal, S. B., Genco, J. M., Cole, B. J. W., and Miller, W. (1999). “Kinetics of oxygen delignification,” J. Pulp Pap. Sci. 25(10), 361-366. Alanko, J., Riutta, A., Holm, P., Mucha, I., Vapaatalo, H., and Metsäketelä, T. (1999). “Modulation of arachidonic acid metabolism by phenols: Relation to their structure and antioxidant/prooxidant properties,” Free Radic Biol Med. 26(1-2), 193-201. DOI: 10.1016/S0891-5849(98)00179-8. An, G. (1998). “Current situation and development of oxygen delignification of pulp,” China Pulp & Paper 7(4), 58-63. Cao, S. L., Zhan, H. Y., Fu, S. Y., and Chen, L. H. (2006). “Study on application of anthraquinone sodium sulfonate to oxygen delignification of bamboo pulp,” China Pulp & Paper 45(2), 199-209. Cao, S. L., Zhan, H. Y., Fu, S. Y., and Chen, L. H. (2007). “Regulation of superoxide anion radical during the oxygen delignification process,” Chinese J. Chem Eng. 15(1), 132-137. Chang, H.-m., McKean, W. T., and Seay, S. (1973). “Delignification of high-yield southern pine soda pulps by oxygen and alkali,” TAPPI 57(5), 105-108. Chen, K. L. (2009). “Analysis on problems and countermeasures in the industrialization of oxygen-alkaline pulping,” China Pulp & Paper Ind. 30(18), 11-13. Chen, K., and Hayashi, J. (1999). “Alkali oxygen pulping of rice straw. (5) Evaluation of black liquor recycling in the pulping process,” Transactions of China Pulp & Paper 1999(1), 33-40. Chen, K., and Hayashi, J. (1997). “Alkali-oxygen pulping of rice straw. (3) – Role of Na2CO3 and NaOH in the pulping,” Transactions of China Pulp & Paper12, 6-10. Fernandez, N., Sabatier, J., Romero, N., Cruz R., Guardarrama, R., and Mieres, G. (1985). “Bagasse delignification: Chemical components relations,” Internet Symp, Wood Pulping Chem, Proc., pp. 263-264. Gao, R., Zou, H., and Yuan, Z. (1997). “Study on the auto-oxidation of pyrogallol by electrochemistry,” Chinese J. Analyt. Chem. 25(3), 297-300. Gang, C., Fu, S. Y., and Liu R. H. (2010). “Analysis of structural changes of Masson pine lignin reacted with superoxide anion radical using NMR spectroscopy,” BioResources 5(2), 1156-1163. Gierer, J. (1997). “Formation and involvement of superoxide (O2•-/HO2•) and hydroxyl (OH•) radicals in TCF bleaching processes: A review,” Holzforschung 51(1), 34-46. Gratzl, J. S. (1992). “The chemical principles of pulp bleaching with oxygen, hydrogen peroxide and ozone – A short review,” Papier 46(10), 1-8. Guay, D. F., Cole, B. J. W., Fort, Jr., R. C., Genco, J. M., and Hausman, M. C. (2000). “Mechanisms of oxidative of carbohydrates during oxygen delignification. I. Reaction of methyl -D-glucopyranoside with photochemically generated hydroxyl radicals,” J. Chem. Technol. 20(4), 375-394. Gümüşkaya, E., Peşman, E., Kirci, H., and Uçar, M. B. (2011). “Influence of plum gum and sodium perborate addition on spruce kraft pulp properties during oxygen delignification,” Sci. Technol. 45(3), 573-582.
van Heiningen, A., and Ji, Y. (2012). “Southern pine oxygen delignified pulps produced in a Berty throughflow reactor: how to obtain the highest degree of delignification while maintaining pulp yield and quality,” Tappi J. 11(3), 9-18. Huang, J. Z., Liu, Y. X., Sun, B., and Shang, Z. (2017). “Microwave-assisted alkali extraction of bagasse hemicellulose enhanced by an enzymatic pretreatment process,” J. Bioresources. Biopro. 2(3), 105-109. Liao, H., and Reitberger, T. (2013). “Generation of free OH radicals by black light illumination of Degussa (Evonik) P25 TiO2 aqueous suspensions,” Catal. 3(2), 418-443. Li, Y.-m., Chang, H.-m., and Jameel, H. (1999). “Effect of sulfidity on the selectivity of RDH delignification,” Transactions China Pulp.Pap. 1, 1-5. Liu, R. H., Fu, S. Y., and Zhan, H. Y. (2008). “Formation of oxygen radicals and their selectivity reaction with lignin and carbohydrates in oxygen delignification: A review,” Transactions of China Pulp & Pap. 62(11), 1459-68. Lin, X., Wu, Z., Zhang, C., Liu, S., and Nie, S. (2018). “Enzymatic pulping of lignocellulosic biomass,” Ind. Crop. Pro. 120(2018), 16-24. Ljunggren, S. (1990). “The kinetics of lignin reactions during oxygen bleaching. Part 2. the reactivity of 4,4’-dihydroxy-3,3’-dimethoxystilbene and -aryl ether structures,” Nor. Pulp. Pap. Res. J. 5(3), 148-154. Ma, X.J. (2014). Study on the Dissolution Rule and Degradation Mechanism of Prehydrolyzed Carbohydrate in Bamboo, Ph.D. Dissertation, Fujian Agriculture and Forestry University, Fujian. Nada, A. A. M. A., Fahmy, Y., and Abo-Yousef, H. E. (1998). “Kinetic study of delignification of bagasse with butanol-water organosolv pulping process,” J. Sci. Ind. Res. 57(8), 471-476. Poukka, O., Isotalo, I., and Gullichsen, J. (1999). “Optimal delignification degrees of cooking and oxygen/alkali stage in production of ECF bleached softwood kraft,” Paperi Ja Puu. 81(4), 316-324. Ragauskas, A. J., Lucia, L. A., and Jameel, H. (2005). “Final technical government report of the high selectivity oxygen delignification project,” U. S. University of North Texas Libraries, Digital Library crediting UNT Libraries Government Documents Department. Río, J.C.D., Lino, A.G., Colodette, J.L., Lima, C.F., Gutiérrez, A., and Martínez, Á.T., et al. (2015). “Differences in the chemical structure of the lignins from sugarcane bagasse and straw,” Biomass. Bio. 81, 322-338. Samuelson, H.O., and Abrahamsson, K.E. (1978). “Oxygen-alkali delignification of lignocellulosic material in the presence of a manganese compound,” U.S. Patent No. 4,087,318. Shi, S. L., and He, F. W. (2003). Analysis and Testing of Pulp and Paper, China Light Industry Press. Sjöblom, K. (1996). “Extended delignification in kraft cooking through improved selectivity. Part 5. Influence of dissolved lignin on the rate of delignification,” Nor. Pulp. Pap. Res. J. 11(3), 177-185, 191. Yang, S. H. (2010). Plant Fiber Chemistry, China Light Industry Press, Beijing, China, pp. 93-94. Zhan, H. Y. (2011). Pulp Principle and Engineering, 3rd Ed., China Light Industry Press, Beijing, China, pp. 245-328. Zhang, X. J., You-Ming, L. I., Chen, K. L., and Liu, B. L. (2008). “Alkali pretreatment and oxygen-alkali pulping of bagasse,” Pap. Pap. Making. 27(4), 17-20. Zhang, H., Lyu, G., Zhang, A., Li, X., and Xie, J. (2018). “Effects of ferric chloride pretreatment and surfactants on the sugar production from sugarcane bagasse,” Bioresource Technol. 265(2018), 93-101. Zhao, B. L. (1999). Oxygen Free Radicals and Natural Antioxidants, Science Press. Zhen, S., Bing, S., Yuxin, L., and Li, B. (2018). “Effect of wet storage on alkali-oxygen pulping of bagasse,” J. Bioresources. Biopro. 3(1), 14-17. Zou, Y. J., Xu, L. X., and Liu, H. B. (2007). “Selectivity of peracetic acid delignification,” Paper and Paper Making 26(1), 35-37. Article submitted: August 11, 2018; Peer review completed: October 11, 2018; Revised version received and accepted: November 22, 2017; Published: November 30, 2018.